Every once in while it's fun to experiment with other materials and techniques. This giraffe is one of three jungle-themed canvas panels I've made for my niece's baby's room. 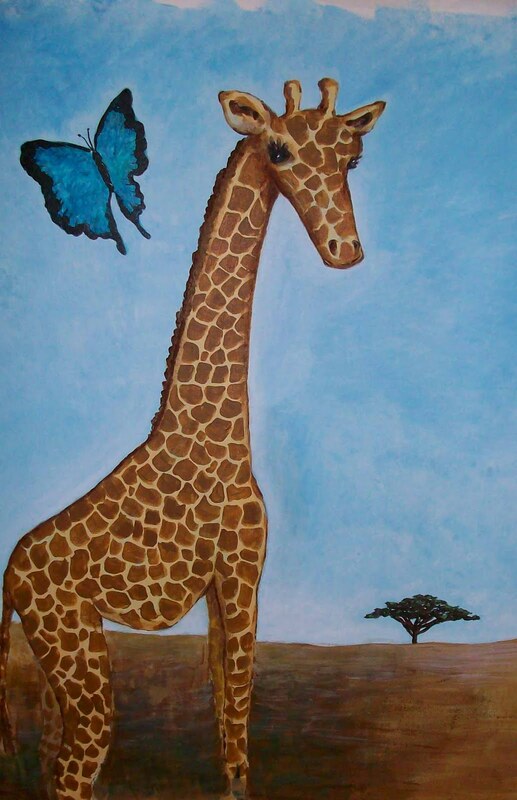 My sister had originally painted a mural on two walls of her room, but the kids had to leave that house after my sister died. Obviously they couldn't take the walls with them, so I offered to re-create the mural on canvas. It turned out to be a bigger job than I had anticipated! Not only do I have little experience with acrylics, but three large (about 36" square) paintings is a lot to tackle for a novice! But I charged ahead (fools rush in ... etc.) and actually had a good time. Learned a lot about color mixing, proportion, background values, and balance, among other things. My friend Christine Turner, a former art teacher, was kind enough to give me some pointers. I think I'll be sticking to mosaics for the time being, but it was a pleasant change of pace, and who knows? I might get the bug to do more someday. Update on the Madonna mosaic of Encinitas, which I wrote about last week: The city council has voted to have it removed. They will have a hard time of it; apparently whoever put it up used a strong epoxy glue. You might remember my post several months ago about this bird mosaic -- a contribution to a charity project organized by friend and fellow mosaic artist Eve Lynch in Fort Myers, Florida. The project is now finished, a huge success and well loved by all who see it. 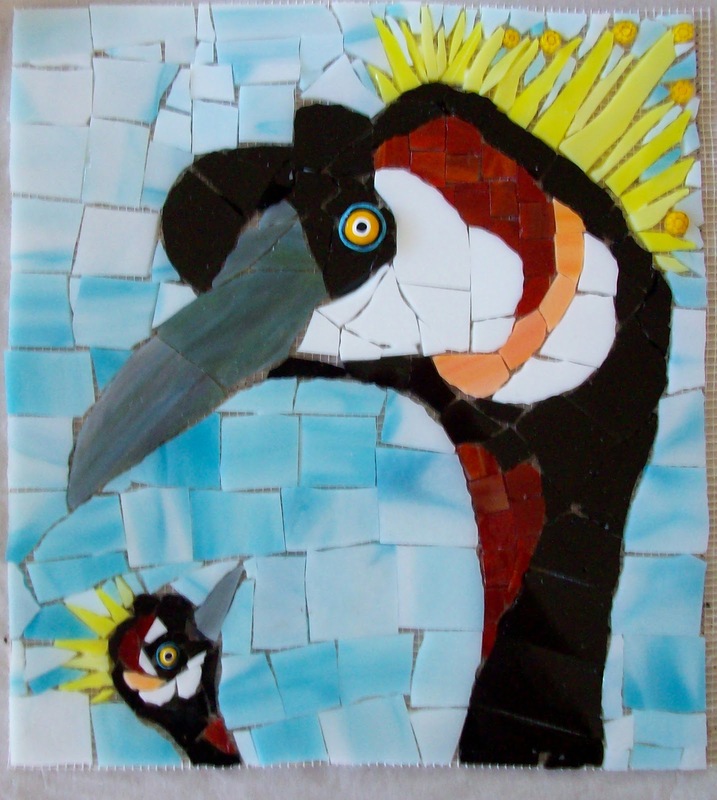 The venue is the Joseph A. Messina Children's Center, and the finished mosaics -- all donated by artists from around the world -- have been installed, grouted and labeled on various walls around the facility. You can read about the project here on Eve's special blog. I was just listening to NPR and heard the story about this mosaic, which appeared under a bridge in Encinitas, California, last night. It's 10 by 10 feet and made of stained glass. Obviously some talented artist made it, and invested quite a lot of money in materials. It shows beautiful movement, in the drapery and the waves, and the face and hands are remarkably detailed. City officials are in a quandary, because the piece qualifies as graffiti, technically illegal, but who could take down something so lovely? 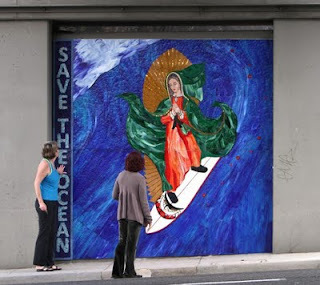 The words on the side say "save the ocean," but it might well say, "save the mosaic." 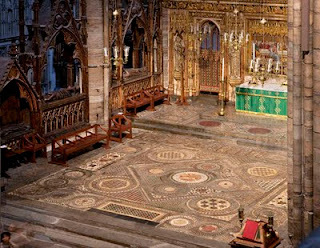 Those who were lucky enough to have a seat in Westminster Abbey for the royal wedding last Friday might have caught a glimpse of this floor. It is a mosaic created in 1268 (!) 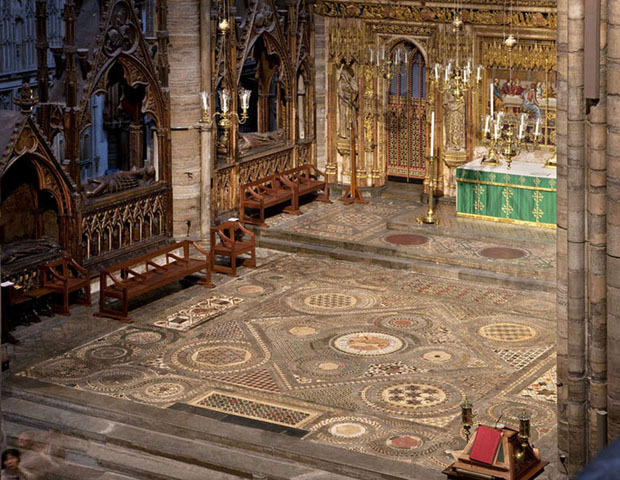 but usually covered up when the Abbey was used for special occasions because it was in such disrepair. It was recently restored with the help of a grant from the Getty Foundation (read the full story here). It's called the Cosmati pavement after its Italian creators, a family of famous skilled artisans of the time. The floor is 24 feet square (which actually makes my knees hurt just thinking about the time it took to create). It's truly a stunning and intricate Medieval piece - almost abstract, with its variety of designs and images that are all different. In addition to marble, the floor is made from onyx, purple porphyry, green serpentine, and yellow limestone, with opaque glass pieces in cobalt blue, red, turquoise, and bluish-white. It is a clear testament to the enduring beauty of mosaic in all its forms.